For software-intensive companies, we provide, based on a self-assessment survey, quantitative insight into the state of your development practices as well as actionable advice on how to improve. You can choose which survey dimensions are relevant in your organization. Quantitative analysis how your organization is doing in selected dimensions. Below is an example graph showing quantitative results (scale 1-5) within five different dimensions. Anonymous data collected over the years is used to show how your organization is doing compared to other companies, similar to your organization. 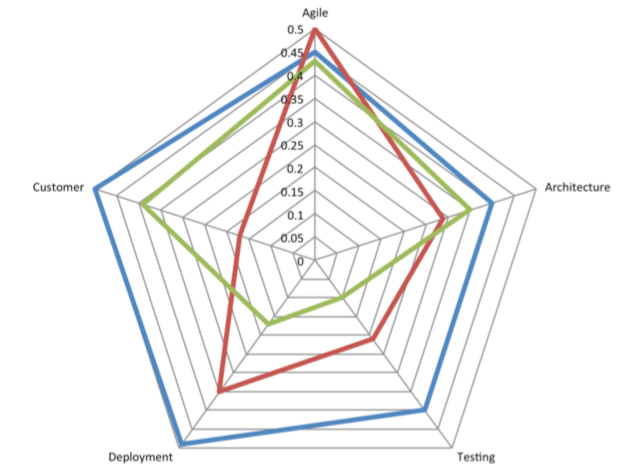 Below is an example statistics of deployment practices within a group of companies. c) How your organization is doing since analysis was last made? If you perform this survey regularly e.g. once a year, you can follow up how your improvements are affecting efficiency of the organization in time. d) What actionable recommendations do we advise you to focus on now? Based on decades of research and experiences from dozens of other companies, we provide you with advise on the next steps to take in order to improve your development practices. Who should use this survey tool? Particularly useful for any leader who is concerned with R&D. The survey will assist in making decisions about R&D efficiency and current state of practices. It is cost efficient when implemented as a web survey. It provides a deep analysis. Survey is developed over several years of experience and is hand customized for your organization. It provides fast results. Most often, two weeks is a long enough time to collect the data. Results include actionable recommendations how to continue your improvements after the survey. © Jan Bosch 2016-2018 / all rights reserved.